Since we accidentally acquired a parakeet, we go through quite a bit of bird seed. Steve– the parakeet– gets a fresh bit of food each day, but never quite finishes yesterday’s. I didn’t want Roger simply pitching the old into the yard as that attracts rats and Ruby — the dog — would hoover it up (she is a confused dog; part cat, part bird)! So, we built a super simple bird feeding platform. It is a wooden frame with a bit of window screen in the middle. The screen is held to the frame by bits of thin wood nailed to the frame (as seen in the photo). The whole thing is suspended from the house via eye-hooks with coated stainless steel wire. Dead easy to build and made entirely from scrap and junk drawer bits. By going with this open design, we can throw Steve’s leftovers, bits of fruit, seed pods and the like onto the frame. Rats don’t seem to bother it given the proximity to the house and the slippery wires (which, frankly, surprises me a bit). 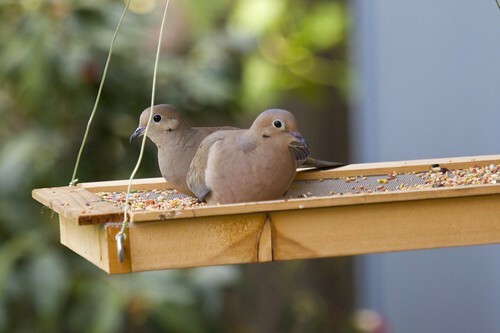 Because it is open, the feeder attracts birds that are normally ground feeders, like this pair of mourning doves that visit the feeder every afternoon. This entry was posted on Tuesday, April 27th, 2010 at 9:34 am	and is filed under Hacks, Photography. You can follow any responses to this entry through the RSS 2.0 feed. You can leave a response, or trackback from your own site. You mentioned rats, but what about squirrels? Here on the east coast, squirrels are plentiful and love bird feeders; they will clean them out in a hurry and leave nothing for the birds. We use special feeders with weighted gates that remain open for smaller, lighter birds, but close up for the heavier squirrels. I can’t tell from the photo how close the feeder hangs from the tree/house/support or how long the support wires are, but I expect my local squirrels would hop to the platform without a second thought. Are squirrels not an issue for you, or does your mounting/location defeat them? I’d love to set up a similar platform feeder here specifically for birds.